Discworld Series – It's Time to Read! This is the final book in Terry Pratchett‘s amazing Discworld Series. This is one of my favourite book series – so many characters, so many adventures, so much humour. These books are well written, they are hilarious, there is always danger and adventure, and the characters are fabulous. There are 41 books in this series, and I am pleased to say I have read them all! I really enjoyed The Shepherd’s Crown. This book had all the elements I mentioned above. This novel is the 5th book in the Tiffany Aching mini-series, which also features the witches, Granny Weatherwax and Granny Ogg. Tiffany has found herself in the position were she must save the Chalk from the fairies, who are getting set to attack. She must keep her wits about her, round up the witches, plus the folk of the Chalk, and get set for battle. As ever, this book was entertaining from the start. Pratchett never fails to draw me in and keep me hooked. He uses characters I love – I was pleased that Death had a cameo in this novel, he is one of my favourite Discworld characters – and he writes such good stories! 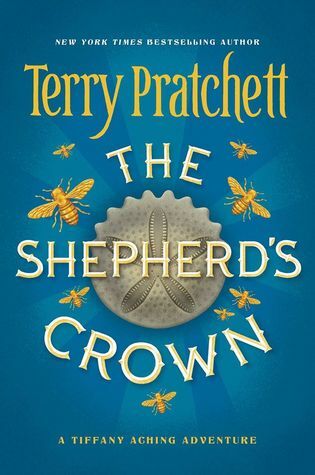 In other Discworld novels, other reviewers have felt that there is too much going on in the story; I didn’t feel this was the case with The Shepherd’s Crown. We had the story of Tiffany, and her rise as a witch on the Chalk, we had the story of Geoffrey, the man who wanted to be a witch, and his work alongside Tiffany; and of course there is the elves storyline. All three worked well together and brought us to a great climax – the battle for the Chalk. I have read other reviews about this book which mention that Pratchett died before this novel was completed, and that it is obvious in places that he hadn’t quite filled out some of the story. To be honest, I didn’t notice this. I was excited that there was a final book, grateful that I was able to go back to the Discworld one more time and I just enjoyed the story. I was reminded somewhat of Julia Kagawa’s Iron Fey series when we were in the world of the fairies. This is another series I enjoyed so this isn’t a criticism. The stories are very different, but as I was reading it there were moments when I was transported into Kagawa’s world. This book ticked all the boxes for me. It was entertaining, gripping, humorous and enjoyable. This is an excellent fantasy novel. It didn’t feature all my favourite characters – I really like the characters based in Ankh-Morpork, such as the Wizards – but I found the Nac Mac Feeble really funny. However, if you have read any Discworld novels, you will also see the sadness in the pages. This is a goodbye to the Discworld series, and to Terry Pratchett. I am rating this novel 4 out of 5, and I am gutted there won’t be another Pratchett novel. 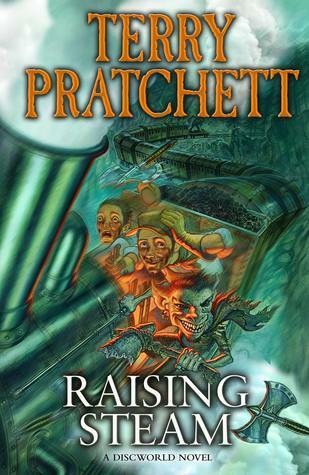 Book number 14 for me in 2014 was Terry Pratchett’s Raising Steam, which is the 40th book in his Discworld series. I have read all 40 of these books and enjoyed each one of them. A large part of me is tempted to start them again from the beginning – what a fabulous series to re-read! I have seen plenty of poor reviews for this novel, and I won’t write too much now, but suffice to say, I liked it! 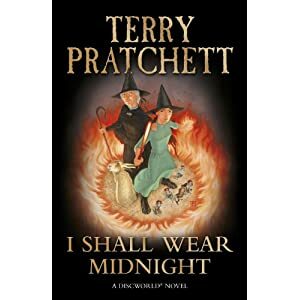 I did think that Sir Terry managed to mention almost every major character he has based a novel on – except the Witches – and that did leave me wondering if this is the last Discworld novel, which would be sad although understandable. There was a lot happening in this book, but I really enjoyed it. I listened to the audiobook version and I liked Steven Brigg’s narration. I have rated this 4 out of 5. I love the Discworld books. Waiting on Wednesday – or WoW – is a weekly meme hosted by Jill at Breaking the Spine. A man with no eyes. No eyes at all. Two tunnels in his head …It’s not easy being a witch, and it’s certainly not all whizzing about on broomsticks, but Tiffany Aching – teen witch – is doing her best. Until something evil wakes up, something that stirs up all the old stories about nasty old witches, so that just wearing a pointy hat suddenly seems a very bad idea. Worse still, this evil ghost from the past is hunting down one witch in particular. He’s hunting for Tiffany. Andhe’s found her…A fabulous Discworld title filled with witches and magic and told in the inimitable Terry Pratchett style, “I Shall Wear Midnight” is the fourth Discworld title to feature Tiffany and her tiny, fightin’, boozin’ pictsie friends, the Nac Mac Feegle (aka The Wee Free Men). I love the Discworld series and cannot wait for the next one to be released! The Heroine: Tiffany Aching, incipient witch and cheese maker extraordinaire. Once saved world from Queen of the Elves. Is about to discover that battling evil monarchs is child’s play compared to mortal combat with a Hiver (see below). At eleven years old, is boldest heroine ever to have confronted the Forces of Darkness while armed with a frying pan. The Threat: A Hiver, insidious disembodied presence drawn to powerful magic. highly dangerous, frequently lethal. Cannot be stopped with iron or fire. Its target: Tiffany Aching (see above). The Nac Mac Feegle: A.k.a. the Wee Free Men. Height: six inches. Color: blue. Famed for drinking, stealing, and fighting. Will attack anything larger than themselves. Members include: Rob Anybody, Daft Wullie, and Awfully Wee Billy Bigchin. Allies to Tiffany Aching (see above). The Book: Hilarious, breathtaking, spine-tingling sequel to the acclaimed Wee Free Men. I am giggling even as I sit here and write this review – this is another genius book from Terry Pratchett. It is number 32 in the Discworld Series and the sequel to the Wee Free Men. The star of this story is Tiffany Aching, a very young yet powerful witch. She is fearless and happy to fight anyone. And who wouldn’t be, when your side-kicks are the Wee Free Men – angry, small, blue Nac Mac Feegle. They will fight anything – nothing holds them back. In this book the Hiver is trying to take over Tiffany, and she has to protect herself and others from it. The witch she is staying with can’t help her, so in comes Granny Weatherwax. Granny must teach Tiffany how to be a witch, and that way she will win. This book is hilarious. I love Granny Weatherwax – especially when she is “borrowing” and has the sign “I aint’en dead!” She is clever and to the point, and very funny. Pratchett has started to show her frailness and age in these novels, which means sense as she is an old witch, but it would be a shame if she was to disappear from the Discworld. Tiffany is another fun character. Her focus on how she is good at making cheese is entertaining, and watching her discover herself is interesting. I like that even at 11 she is headstrong and determined, and so powerful! She is a good character. The best people in this book however were easily the Nac Mac Feegle. Rob Anybody is so funny! I love that they don’t need any encouragement, they just fight – it is genius! Their actions and words are hilarious. They are some of the best characters Pratchett has created I think. Like all the other Discworld books, I was gripped from the start and thoroughly enjoyed myself as I was immersed in this world. There is adventure, fighting, magic, stuck-up little girls, drink, scary Nac Mac Feegle wives and Granny Weatherwax – everything a good book needs! Pratchett is not short of imagination, and this book is testament to that. He is descriptive so you feel like you are there watching the action and his humour is awesome. I laughed a lot during this novel. I always find it so easy to recommend his books because they are extraordinary in so many ways. Pratchett is intelligent, witty and a gripping writer. His books are never dull, there is always something funny going on and the characters are unique and often very special. I can easily give this 4/5. What would have made it better was Nanny Ogg alongside Granny Weatherwax, and maybe a larger role for Death! Polly becomes Private Oliver Perks, who is on a quest to find her older brother, who’s recently MIA in one of the innumerable wars the tiny nation of Borogravia has a habit of starting with its neighbors. This peevish tendency has all but expended Borogravia’s ranks of cannon fodder. Whether Sergeant Jackrum knows her secret or not, he can’t afford to be choosy, as Perks and her/his comrades are among the last able-bodied recruits left in Borogravia. This collection of misfits includes the aforementioned vampire (reformed and off the blood, thank you), troll, and macabre Igor, who is only too happy to sew you a new leg if you aren’t too particular about previous ownership. Off to war, Polly/Oliver learns that having a pair of, um, socks is a good way to open up doors in this man’s army. This is number 31 in the Discworld series, and one of the better ones 🙂 The star of this story is Polly, who has disguised herself as her dead brother Oliver so she could join the army. She wants to go fight in order to find her older brother Paul. 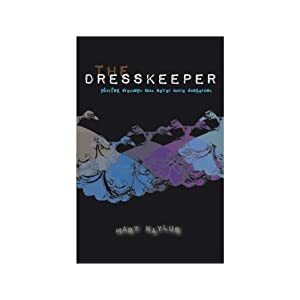 She thinks she is the only girl in the regiment, but then someone gives her a pair of socks to use as an area of her anatomy, and she starts to suspect there is another girl amongst the men, but who is it? Along with that, Polly and her comrades have become feared, after taking out a group of bandits. Polly sets off to war, and learns many things along the way. This book had me laughing most of the way through. Terry Pratchett wrote another book that is full of adventure, humour and imagination. This novel is all about girl-power, coffee and a pair of socks! There are several images that will stay with me for a long time I think – such as Malachai the vampire having caffeine withdrawal symptoms, which I found very funny! Again, Pratchett wrote a book full of weird and wonderful characters. I liked Polly, she was headstrong and clever; and I loved her band of brothers. Working out who was female was fun, and they were all funny in their own ways. I don’t know how Pratchett came up with characters like vampires who like coffee not blood or Egors, who mend themselves with other people’s body parts. His imagination is incredible. I really enjoyed this book. It is one of my favourite from the Discworld series and I would highly recommend it. “Another world is colliding with this one,” said the toad. “All the monsters are coming back.””Why?” said Tiffany. “There’s no one to stop them. Armed only with a frying pan and her common sense, Tiffany Aching, a young witch-to-be, is all that stands between the monsters of Fairyland and the warm, green Chalk country that is her home. Forced into Fairyland to seek her kidnaped brother, Tiffany allies herself with the Chalk’s local Nac Mac Feegle — aka the Wee Free Men — a clan of sheep-stealing, sword-wielding, six-inch-high blue men who are as fierce as they are funny. Together they battle through an eerie and ever-shifting landscape, fighting brutal flying fairies, dream-spinning dromes, and grimhounds — black dogs with eyes of fire and teeth of razors — before ultimately confronting the Queen of the Elves, absolute ruler of a world in which reality intertwines with nightmare. And in the final showdown, Tiffany must face her cruel power alone…. This is book number 30 in Terry Pratchett’s Discworld novel. This is a Tiffany Aching novel, a young adult twist on the Witches novels. Tiffany is called upon to rescue her brother from the Queen in an alternative universe and for help she has the Wee Free Men and a Toad. She calls upon powers she didn’t know she possessed – the witch in her comes out as she fights the Queen of the Elves with just a frying pan. I found this story slow to start but by half way through I was hooked. The Wee Free Men are hilarious! I loved that they just wanted to drink and fight! The end made me laugh, when poor Rob Anyone thought he might have to marry Tiffany – his fear was funny! I liked Tiffany too. She was headstrong, determined and inventive. She kept fighting and wouldn’t let anyone take/insult her brother – although it was OK for her too. As usual, Pratchett has written a fantastic novel. It is funny, full of action and with great characters. I would have liked Nanny Ogg and Granny Weatherwax to feature more in this book but Tiffany was a delightful character. This is aimed at young adults but that doesn’t come through or ruin this book. This has everything you would expect from Pratchett and is well worth reading. I don’t think I read a bad book last month, which is always a pleasure. All in all, this has been a good month! Time is a resource. Everyone knows it has to be managed. And on the Discworld that is the job of the Monks of History, who store it and pump it from the places where it’s wasted (like the underwater – how much time does a codfish need?) to places like cities, where there’s never enough time. But the construction of the world’s first truly accurate clock starts a race against, well, time for Lu Tze and his apprentice Lobsang Ludd. Because it will stop time. And that will only be the start of everyone’s problems. THIEF OF TIME comes complete with a full supporting cast of heroes, villains, yetis, martial artists and Ronnie, the fifth Horseman of the Apocalypse (who left before they became famous). This is number 26 in the Discworld series – another one I read out of order. Since reading this novel I have read over a dozen other novels, and as I sit here to write the review, this does not jump to the front of my memory. This is a shame because I love Pratchett’s novels, and this is the first time that I can’t fully remember the novel. There are many things I do remember however: I loved Ronnie. The idea of the fifth Horseman of the Apocalypse made me laugh. I liked all the Horsemen to be honest. It made me laugh that while Death was trying to round them up they couldn’t be bothered to ride out, and that their wives were holding them back. Genius! Of course, I love Death. Every time I meet him in a book I laugh. I liked that Granny Ogg got a mention – I always enjoy the witches. And I love Susan, especially her interactions with Death. She always seems exasperated with him, she reminds me of a reluctant, moody teenager. Like I said, I don’t really remember the story but the characters do stick out and I think that is important. For me, this is the weakest Discworld novel and that is a shame. Commander Sam Vimes of the Ankh-Morpork City Watch had it all. But now he’s back in his own rough, tough past without even the clothes he was standing up in when the lightning struck…Living in the past is hard. Dying in the past is incredibly easy. But he must survive, because he has a job to do. He must track down a murderer, teach his younger self how to be a good copper and change the outcome of a bloody rebellion. There’s a problem: if he wins, he’s got no wife, no child, no future…It is a discworld tale of one city, with a full chorus of street urchins, ladies of negotiable affection, rebels, secret policemen and other children of the revolution. Truth! Justice! Freedom! And a Hard-boiled Egg! This is number 29 in the Discworld novels and one of my favourites. In fact, I have just noticed that on the Terry Pratchett website, this is voted the number one book! In this instalment we follow Sam Vimes as he travels back in time to help his younger self in the great battle. I loved this. I really enjoyed both Sam’s. The younger is naive and sweet, always thinking about what his Mum would say; and the older is much more cynical but we see a wonderful caring side as he looks out for his younger self. I thought this was a great novel. It was full of excitement and action. And of course, all of Pratchett’s humour. I could only laugh at the way the old force thought. The picket line was a great example of how Pratchett’s mind works – pure genius. There is fighting and death and some great villans – and a young Fred Colon and Nobby Nobs. I laughed most of the way through this and was gripped. This is definitely one of the best in the series. Top notch!